Team Rooket opened up a useful 3 point lead at the top of the SCA Championship after their win at the Hawkands Hill Run last weekend. Their aggregate total distance of 2274m put them 228m ahead of Where's Me Spanners. They also took time to answer all the inquisitive peoples questions about their carties and chatted away generally with other competitors and spectators. They were presented with the cup, winners rosette and £20 prize money, and they promptly donated the £20 prize money back to the charity funds for Leukaemia and Lymphoma Research and MacMillan Cancer Care. The total rasied has not been finalised, but is though to be around £600. 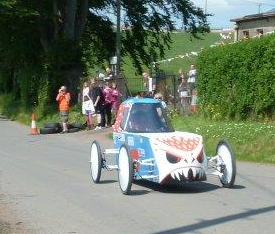 The next race in the SCA Championship is the Drumlanrig Gravity Grand Prix at the end of August. With two races still left in the championship anything is still possible and even those teams that didn't attend Hawklands Hill still have a chance of lifting the trophy. Submitted by scottishcarties on July 8, 2013 - 15:23. The second round of the SCA Championship is this Sunday at the Hawklands Hill Run near Glasgow. This race is slightly different to the normal timed races, with the winner being the one who travels furthest down the course. 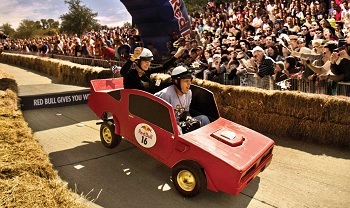 The course includes several features to test the skill and courage of the competitors and the handling of their vehicle. 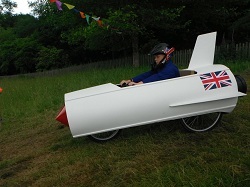 The event is an open, but limited, series of competitions for non powered bogies, carties and sidecars to compete down a closed public roadway over a course of approximately 800m, and King of the Hill pushbike hill climb with various other activities including can shy, hoopla and treasure hunt, refreshments, etc. Although the race is this Sunday there are still places available. Please contact the organisers directly if you would like to race. Submitted by scottishcarties on July 5, 2013 - 19:23.